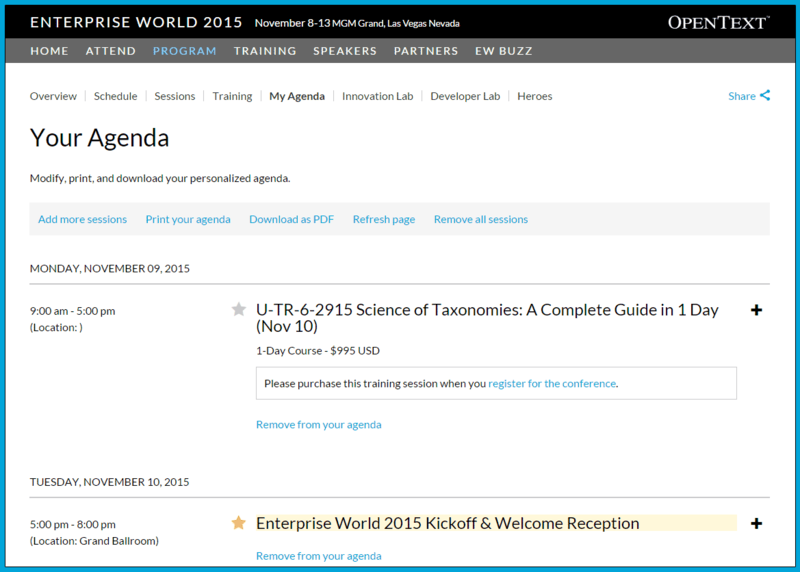 The OpenText Marketing team wanted prospective attendees to create customized agendas of conference sessions to justify cost to management and help attendees manage their time at the event. We developed personas based on previous conference data—prospective attendees, registered attendees, and internal Sales people—then through a collaborative process developed a set of user stories based on their needs. Building on our user stories, I constructed wireframes to encompass the agenda builder journey: finding sessions, adding sessions to an agenda, viewing an agenda, making changes, and finally sharing an agenda. We reviewed the initial concept with the Marketing team and iterated the design until we had satisfied the business requirements. My colleague and I performed usability testing with participants who had never used the Enterprise World site, utilizing paper prototypes and recording the sessions to review with the rest of the team. Using candid participant feedback, I was able to show stakeholders where design and requirements needed improvement before moving into development. 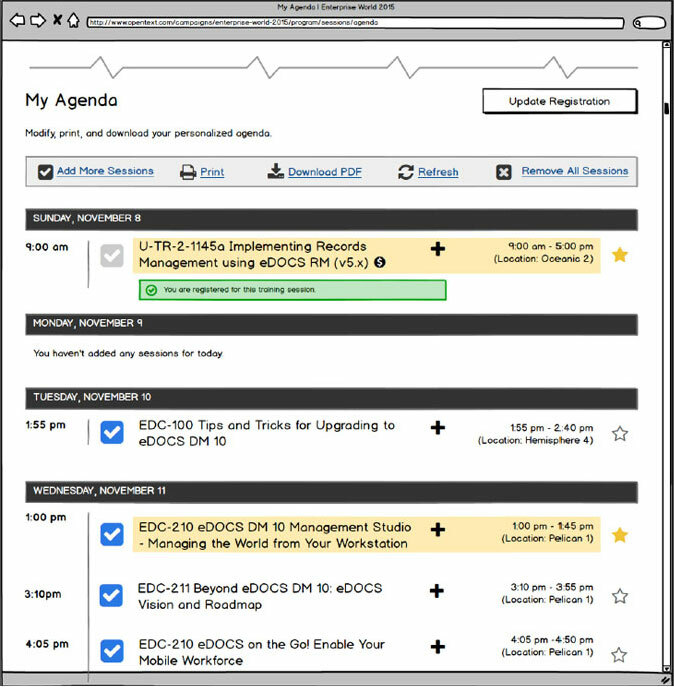 Participants found the warning message that popped up when adding training sessions to their agendas confusing. I thought that's what I was doing, registering for a training session. We adjusted messages about registering for training to in context alert boxes based on a user's registration status for the conference. The conference website was already live, so we had to work with the web team to adapt our concept into the existing design. I helped keep us on track during development by managing issues in JIRA for each deployment. Additionally, I created test plans for quality assurance and user acceptance testing and was responsible for verifying development tasks after deployment to QA. After launching the project, I wrote a usability test plan that we ran with eight participants on the live site. 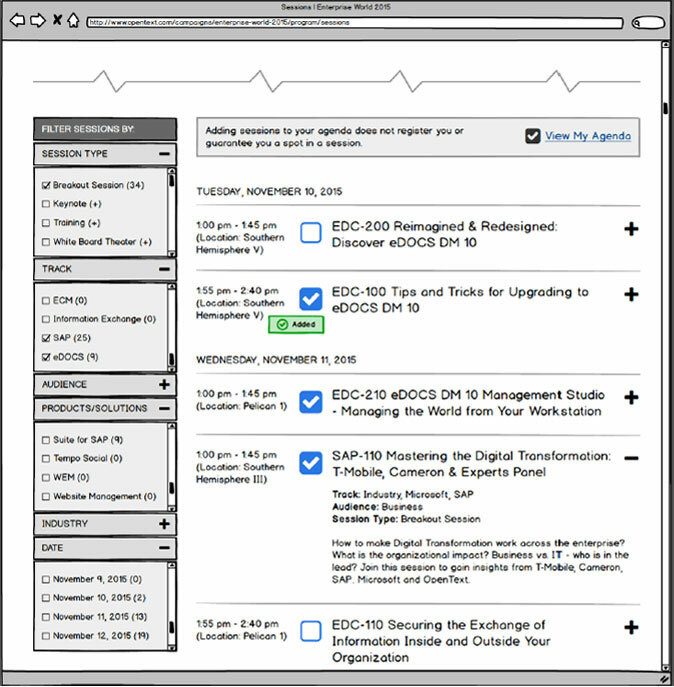 Feedback was generally positive for the design and functionality of the agenda builder piece, but we did uncover some usability issues that arose when people navigated the site as a whole. Only two participants were able to sign in to the site successfully meaning the task had a 75% failure rate that participants rated as difficult. The problem was two-fold: most users gravitated to the "sign in" link in the upper right of the page, but this link took them to the 3rd party registration site; additionally, the "sign in" link within the page content did not stand out. The sign in button is always on the upper right side, at least it is for 90% of all websites, so that's easy. [...] Oh! No, no, no. Sorry that's something that’s wrong. The "sign in" link at the upper right should take users to the website's sign in page. Once signed in, the link should change to "sign out". Links to the 3rd party registration site should be clearly labeled and differentiated. The "sign in" link next to the agenda builder could stand out more.